Greek mythology is seemingly a very popular theme in the West End right now. 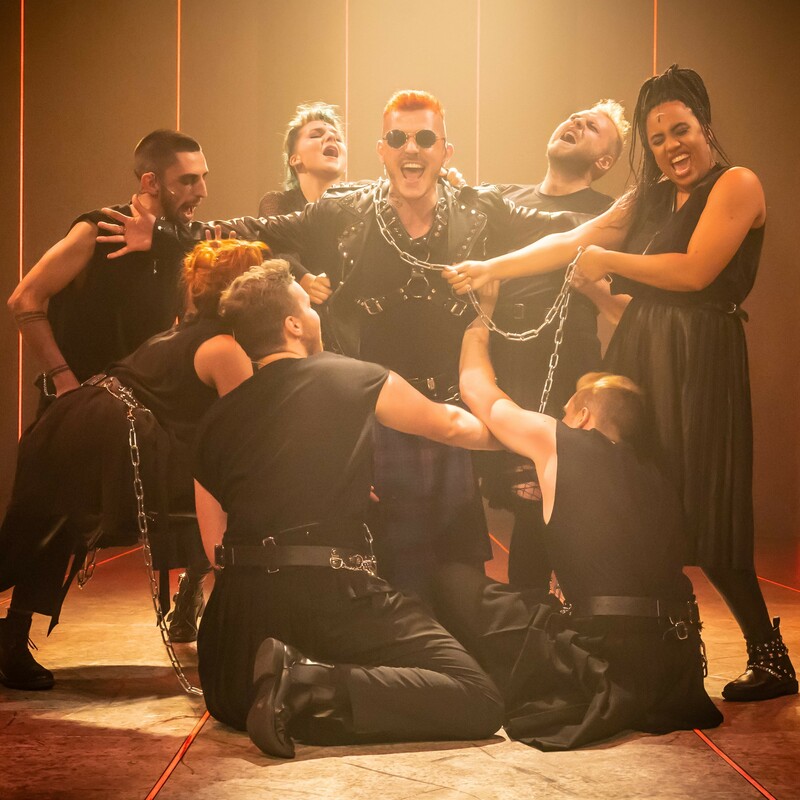 With productions such as Myth: The Rise and Fall of Orpheus, Orpheus: The Mythical and the upcoming run of Hadestown at the National Theatre ( our review in 2016 in New York), Mythic slots itself nicely into London's Theatreland. At the 29th Annual Festival of New Musicals in New York, this musical had its first outing as Persephone. Now, with a new name, Marcus Stevens (book and lyrics) and Oran Eldor (music) have brought the show across the pond and into London's Charing Cross Theatre. Set in Ancient Greece but in the present day, Mythic is a coming-of-age story about a young teenage girl wanting to find her own way in the world and gain independence away from her overprotective mother. That angsty teenage girl is Persephone (Georgie Westall), daughter of Earth goddess, Demeter (Daniella Bowen). Persephone is obsessed with the world of celebrity and longs to be like the Gods and Goddesses of Olympia. So, she decides to rebel and heads to Mount Olympus to make her dreams a reality. Along the way, she crosses paths with Hades (Michael Mather), a punky bad boy who is God of the Underworld and although now they don't know it, both of their lives will be changed forever. Packed with pop-rock songs, Mythic plays through its 90 minute duration barely giving the audience time to breathe. The show opens with the information heavy number "It's a Myth" that hits you in the face and tries to bring you up to speed on all of the history of the Greek Gods in a very short space of time. Unfortunately, some of the lyrics and jokes get lost in this opening number, possibly due to the volume of the band, something which seems to be an ongoing problem at various points throughout the show. Nonetheless, it was not hard to follow the story and have a grasp of what was going on at any given point. Later on, we are introduced to Aphrodite (Genevieve McCarthy), Goddess of Love and daughter of the God of all Gods, Zeus (Tim Oxbrow). Aphrodite is a Daddy's little girl with lots of the expected sass, attitude and foot stomping. Her song "Mess Around" is a fierce pop princess number and was one of two songs that stood out. The other being "Dark Damaged Soul" which is performed with great power and effortless style by Mather, who is making his professional debut in Mythic. Throughout the entire performance, his singing ability is well showcased and made for enjoyable listening. "I Return to You" is the finale number, yet it lacked the energy and punch that I would have expected from this kind of production. In fact, some cast members looked visibly tired by this point in this whirlwind of a show. Although the musical is supposedly set in the present day, it felt more 2008 than 2018. Persephone is a dead ringer for early era Avril Lavigne, complete with signature pink streak in her hair. Aphrodite is dressed head to toe in silver, with hair slicked back into a high ponytail and she wouldn't have looked out of place representing Ukraine in the Eurovision Contest. However, what Lee Newby has designed well is the set; it is sleek yet has an urban edge. There were a couple of smaller, more relevant nods to today's youth like a few of the Gods using vape pens and some of the ensemble carrying takeaway coffee cups whilst discussing "spilling the tea". But, these little things were not enough to bring the show up-to-date. In conclusion, I don't believe 90 minutes was long enough to fit in everything that the writers wanted to put into this show; perhaps some of the songs could have been cut to make room for some moments of sincere dialogue. By the end, the music all tended to blur into one and there just wasn't enough time to create any kind of emotional connection towards the characters. Having said all of this, some of the songs were catchy and wouldn't be out of place in the charts. On the whole, Mythic was a pleasant evening but nothing of mythical proportions.